This 0.31 m (1-ft.) USB extension cable features a Universal / Reversible, A-Male connector, and is manufactured using USB2.0 cable. Universal / Reversible connector allows the cable to be plugged in any direction. This cable is backwards compatible and can also be used with the older USB 1.1 cables. Made with superior foil shielding for reliable error-free data communications. Features nickel plated connectors and gold plated copper contacts for superior conductivity. The cable is manufactured with molded connectors and integral strain relief for extra durability and long life. The significantly faster data transfer rates of USB 2.0 (up to 480 Mbps) makes it perfect for multimedia applications. Stop fumbling around with your computer trying to plug in USB devices. 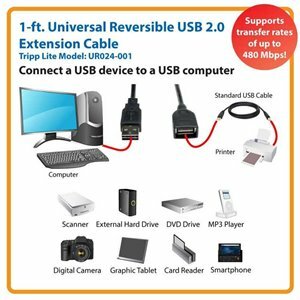 Tripp Lite’s UR024-001 1-foot Reversible USB Extension Cable takes the guesswork out of USB connections. Unlike traditional USB cables that can only be attached one way, this cable features a uniquely designed reversible type A connector that plugs into a computer’s USB port in either direction, making connections easier and faster. Its female end connects to a standard USB cable to extend its length by 1 foot. The UR024-001 is perfect for extending the connection distance of USB peripherals, including scanners, printers, external hard drives, MP3 players, smartphones and digital cameras. For peace of mind, it comes backed by a lifetime warranty and green, RoHS-compliant design. The UR024-001 is constructed of top-quality materials. Nickel-plated connectors with gold-plated copper contacts offer optimal connectivity. Premium-tinned copper braids and aluminum Mylar foil add extra shielding properties for maximum EMI/RFI protection and signal quality. Molded connectors and integral strain relief guarantee long life and durability. A flexible PVC jacket makes the UR024-001 easy to install, even in tight corners and other space-restricted areas. This cable extends the connection distance of USB peripherals, such as printers, scanners, external hard drives, smartphones, MP3 players and digital cameras. It is backward compatible with USB 1.1 cables and supports transfer rates of up to 480 Mbps. It is perfect for everyday users as well as IT professionals. This innovative USB extension cable is the ideal choice for maximum USB 2.0 performance for multimedia and other high-end applications. Its reversible type A connector plugs into a computer’s USB port in any direction, either right side up or upside down. Use the connector on its female end to extend the length of a standard USB cable by 1 foot. The UR024-001 is manufactured in compliance with strict RoHS specifications, reflecting Tripp Lite’s commitment to environmental responsibility. For peace of mind, it comes backed by a lifetime warranty.